Automatic Greasing Systems: FLO Components – Questions to ask when buying an Auto Lube System: automatic lubrication system, central lubrication system, automatic greasing systems, autogreaser – FLO Components – Automatic Lubrication Systems Specialist in Ontario and Manitoba. Whether you know it as an automatic lubrication system, an autogreaser or a centralized grease lubrication system, an ALS automatically lubricates multiple points on a machine from a centralized pump/control unit mounted in an easily accessible location. The primary benefit of an auto lube system is the continuous and frequent application of small amounts of grease providing a uniform supply of grease resulting in improved equipment life. 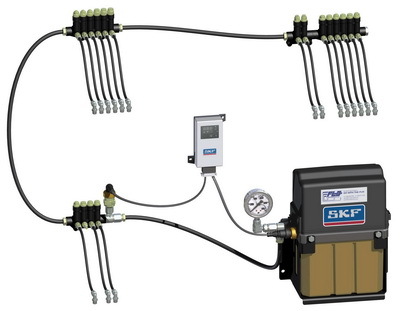 All automatic lubrication systems have 5 main components in common: a controller or timer to run the system; a pump and reservoir to store the grease; a supply line connecting the pump to the metering valves; metering valves or injectors to measure and distribute the lubricant and feed lines and fittings to deliver the lubricant to the application points. 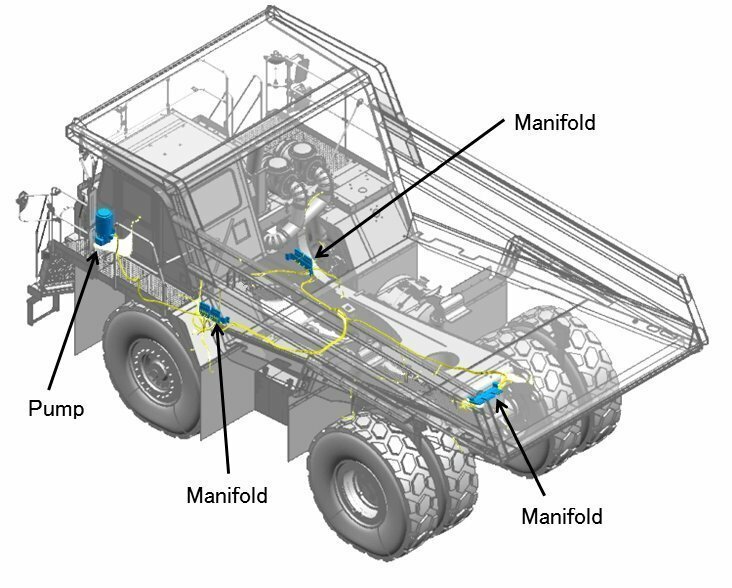 The diagram on the right illustrates a typical parallel type automatic lubrication system installation on a haul truck, with injector manifolds, a pump and reservoir package and distribution lines. WHAT IS THE DIFFERENCE BETWEEN SERIES PROGRESSIVE AND PARALLEL AUTO LUBE SYSTEMS? In a single line progressive system, a pump delivers the lubricant to the lubrication points via progressive metering valves custom-sized for each application points. Lubricant flows through a primary valve which redirects to multiple secondary valves, and finally through feed lines to the ultimate application points. The nature of this system is such that if any line/bearing is not taking grease the entire system shuts down and there is (in a properly designed system) visual indication to the operator there is a problem. 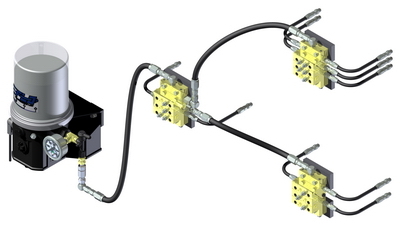 This allows the operator an opportunity to take action before any damage occurs. In a parallel type system, lubricant flows from the pump through a single supply line to multiple branches of injectors. The injectors operate simultaneously but are independent of each other. Each injector serves only one lubrication point and may be accurately adjusted to deliver the precise amount of grease or oil required. The nature of a parallel type system is such that only main line pressure is monitored, so if any feed line or bearing is not taking lubricant, the remainder of the system will continue to function normally, but the lubricant starved bearing may be lost. Contact us now with your application details. Based on your information, we will recommend the best lubrication equipment to meet your application’s specific requirements.